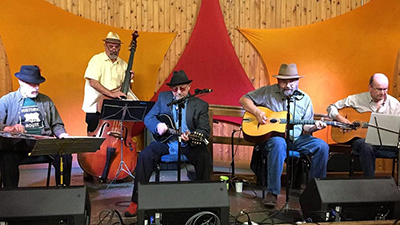 Swingali plays acoustic swing and gypsy jazz standards, with a few unique twists in instrumentation and approach, including mandolin, upright bass, gypsy guitars, and dobro, with guest musicians often sitting on everything from accordion to didgeridoo. Unique versions of the music flow out of the diverse musical backgrounds of the band - including folk, rock, jazz, and a variety of world music influences. The vocal harmonies weave warmth and color into the instrumental quilt that is produced.